Jeronimo Lobo was the last survivor of the small band of Jesuit Fathers who tried, with a measure of success, to reconcile Ethiopia to the Church of Rome. The narrative begins with Lobo's ordination in 1621 and ends seventeen years later. Chosen to serve in India he reached that country after being involved with a naval fight against the Dutch and English off Mozambique. Selected for the Ethiopian mission, he made a remarkable attempt to reach the country from the Somali coast, and eventually made his way to Bailul in the Red Sea and across the Danakil desert. He spent nine years in Ethiopia, principally in the north and in the neighbourhood of the source of the Blue Nile. Exiled when the Emperor restored the authority of the Ethiopian Church, he was handed over to the Turks at Massawa. After suffering much hardship and danger he regained India. Sent to Europe to advocate intervention on behalf of the Ethiopian Catholics, his ship was wrecked on the South African coast. The castaways built two boats, one of which succeeded in rounding the Cape and arriving at Luanda. Here Lobo embarked on a ship carrying slaves to the Spanish main which was captured by the Dutch. 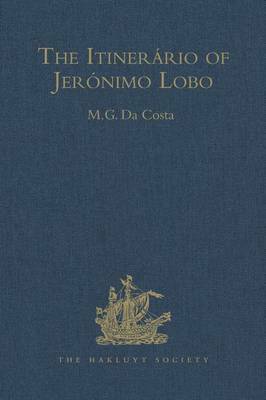 Lobo was marooned on an island but contrived to make his way to Cartagena and Havana and so to Europe. His diplomatic business took him to Madrid and Rome, but his plea for armed assistance for the Ethiopian Catholics did not succeed. Translated by Donald M. Lockhart.